At Nightmares Fear Factory in Niagara Falls, Ontario, Canada, you will find horror, and horror will find you too. In the Nightmares Fear Factory, the halls are dark, narrow, and long. The walls shift. The eyes watch. Hands reach. Things scream. At Nightmares Fear Factory, in Niagara Falls, Ontario, Canada, you will find out how brave you are. Halloween night at Nightmares Fear Factory, Niagara Falls, Ontario, Canada is not an experience you will ever forget. 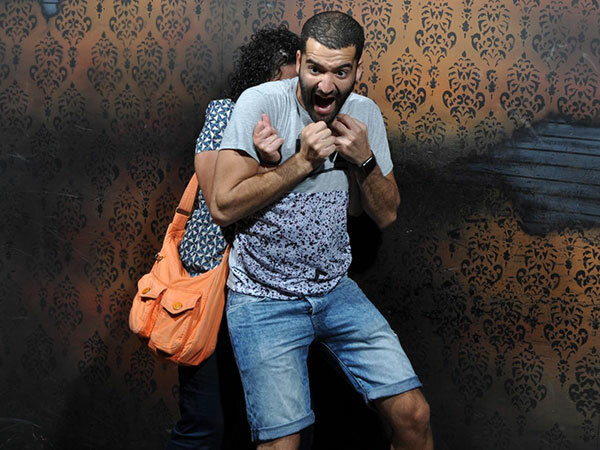 You can’t; there is a wall somewhere in the depths of Nightmares Fear Factory where people are photographed as they confront their own nightmares. The pictures are taken as those fears come screaming toward them at high velocity. On this wall, you can see how people confront their nightmares. Some shrink back and scream. Others thrust their loved ones between themselves and the danger, while still others push their loved ones behind themselves in a vain effort to stand up to those nightmares. 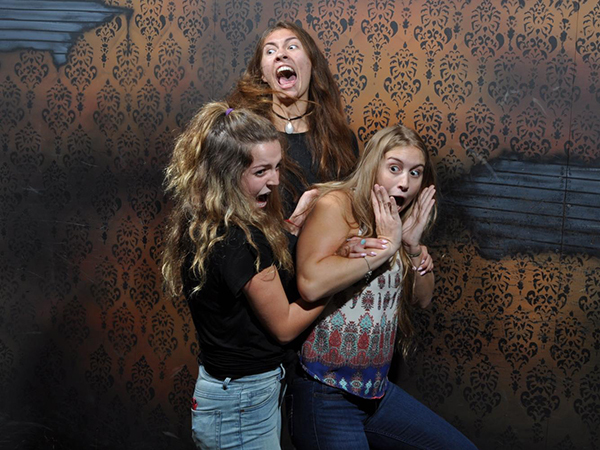 Nightmares Fear Factory on Halloween is the perfect time to find out who your friends really are because the intensity of the attraction is ratcheted up to tension levels thick enough to cut. 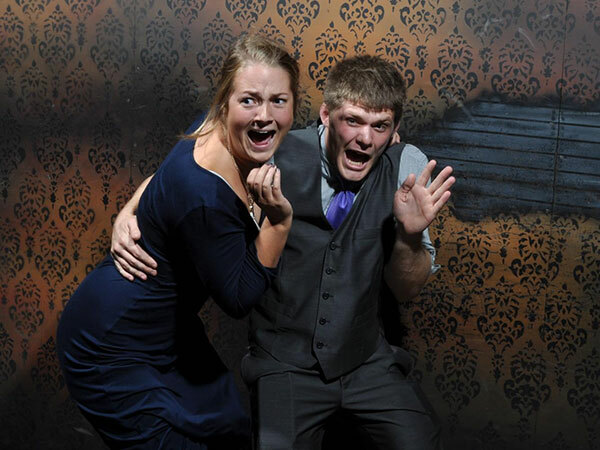 The staff at Nightmares Fear Factory try extra hard on Halloween night. They are professionals, motivated to expose their costumed pretenders, their uniformed invaders as weak, thin-skinned and cowardly. I visited once on a Halloween night, and one of the performers emerged. He looked us over as we got in line to enter the Nightmares Fear Factory, and smiled as though he were a predator sniffing easy prey. I still clearly remember that journey through the Nightmares Fear Factory in Niagara Falls, Ontario, Canada on Halloween night to this day, even though I live now far away and many years have passed since. The man’s smile remains, in tales such as these ones, a bit of foreshadowing. But there is no preparing you for a Halloween night at Nightmares Fear Factory in Clifton Hill, Niagara Falls, Ontario, Canada. Someone who scares people professionally is, admittedly or otherwise, very interested in making amateurs understand the real power of nightmares and the fear factory that creates them. It’s a competition for them, and so it has to be a competition for you, too. Or rather, a competition inflicted upon you, on Halloween night at Nightmares Fear Factory, Niagara Falls, Ontario, Canada. So, you will leave your record on the wall there. You will be sent running by the professionals amped up on Halloween night, a night they wait for all year. Your nightmares will be sent toward you from every direction and at all speeds. You will leave your record on the wall at Nightmares Fear Factory, Clifton Hill, Ontario, Canada. You will never forget it. You will become a picture on a wall somewhere in Nightmares Fear Factory, and passers-by will see how you reacted to your nightmares screaming toward you at high velocity. On that wall, they will see how you confronted those nightmares. Notes from a survivor of Nightmares Fear Factory, Halloween in Niagara Falls.